The “People’s Bailout” Was Just the Beginning: What’s Next for Strike Debt? Thomas Gokey helped create Occupy’s Rolling Jubilee, which is preparing to purchase and cancel $9 million of ordinary people’s medical debt. Here, he speaks about the project’s origins, methods, and future. 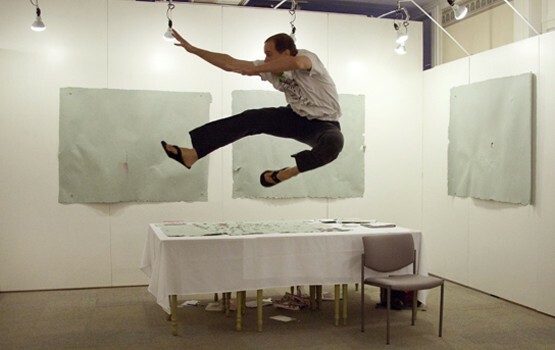 Thomas Gokey executes a jump kick in a gallery, in front of three panels from his art piece, “Total Amount of Money Rendered in Exchange for a Masters of Fine Arts Degree to the School of the Art Institute of Chicago, Pulped into Four Sheets of Paper.” Photo courtesy of Thomas Gokey. The project got good press but the debt remained, and Gokey continued to think about how debt controls people’s lives. This year, together with the activist group Strike Debt, he helped organize a bold “People’s Bailout” called the Rolling Jubilee, which has raised over $465,000 in donations. Bringing that money to the marketplace where collections companies buy and sell debt for pennies on the dollar, Strike Debt intends to purchase about $9 million of Americans’ medical and educational debt—and then cancel it. Strike Debt, which grew out of Occupy Wall Street, wants to foment conversation about the debt we rack up in pursuit of basic needs, and the industries that profit from that debt. Gokey is currently on a year-long unpaid leave from teaching to help organize the Rolling Jubilee and upcoming Strike Debt projects. Fabien Tepper: How did you come to be interested in debt, and how did you decide to talk about it through your artwork? Thomas Gokey: Well, I tend to make work about what I’m thinking about. And debt really controls my life—it’s just this massive burden. I came up with that particular project in 2007 to ’08, after I graduated from art school. I was thinking, my diploma is just a piece of paper, and it costs all this money. And our money is just pieces of paper that are more or less worthless, but we treat them as valuable because they are “legal tender for all debts public and private.” So we’re basically passing around these pieces of paper with IOUs on them. And a lot of artwork is just worthless material, like a piece of paper with some charcoal marks on it. So part of what I got really interested in was, how do we put value on these priceless things? This entry was posted in Interviews and tagged educaitonal debt, interview, medical debt, People's Bailout, Rolling Jubilee, School of the Art Institute of Chicago, Strike Debt, Thomas Gokey, YES! Magazine. Bookmark the permalink.